For applications from engines to heavy transfer cases, cylindrical gears reflect our Company's know-how and extensive expertise to produce quality parts from quantities of a few hundred to tens of thousands per year. Reliable process engineering, advanced technologies and state-of-the-art manufacturing mark the difference between us and the competition. Our Company can use all its extensive means to analyze our Customers' challenges, to take up these challenges and support our Customers until problems are solved and beyond. External diameter 50 - 500 mm. Face width 10 - 120 mm. The latest addition to our manufacturing program, the Gear Shifting Systems range marks indisputably the role of Cattini & Figlio s.r.l. 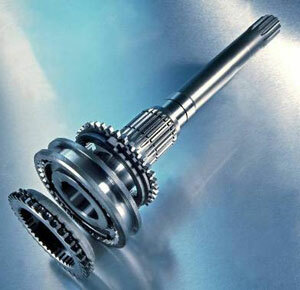 as a leading gear manufacturer and as a global partner for all transmission needs. Engineering capability, manufacturing competence, testing capability, performance analysis are all concentrated into our Gear Shifting Systems range to offer you durability, performance, reliability in operation. Synchronizers with single or multiple cone from 56 to 114 mm. Light/Medium/Heavy duty friction materials available. Wet clutch assemblies featuring electron beam or laser welding, upon request. Cattini & Figlio is market leader in all medium/heavy duty bevel gears applications and is THE choice for all OEMs worldwide in the agricultural, construction, buses, commercial vehicles and special vehicles sectors of activity. Bevel gear sets face-milled up to 600 mm. Bevel gear sets face-hobbed up to 600 mm. Coniflex® and Revacycle® are trademarks of The Gleason Works. Planet gears are among the most stressed gear elements in each vehicle driveline: they have to withstand with the highest torques if they are operated as final drives or they must ensure a smooth operation sometimes at very high speeds if operating in transmissions. The wide choice of processes combined with the heat treatments available in house ends up to an uncompromising quality picture, giving our Customers simply the right answer for their needs and the best gears money can buy! 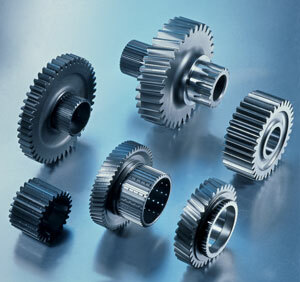 For the true leading edge quality requirements, ring gears can also be ground. Ring gears shaped up to 600 mm. Ring gears Power-Skived up to 600 mm. Ring gears broached up to 380 mm. Heat treatments available for ring gears are: carburising/direct quench, carburising/press quench, induction hardening, gas nitriding. 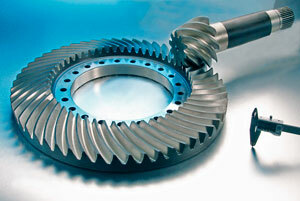 Tooth finish for all sun and planet gears may be hobbed, shaved, ground, CBN ground, superfinished.